My idea for the stump de Noël cake came indirectly. I saw pictures of beautiful traditional bûche de Noël that were decorated with meringue mushrooms but a bûche would not be large enough to feed the number of people expected at the Christmas party so the cake metamorphosed into a larger stump which required more and more elaborate mushrooms. 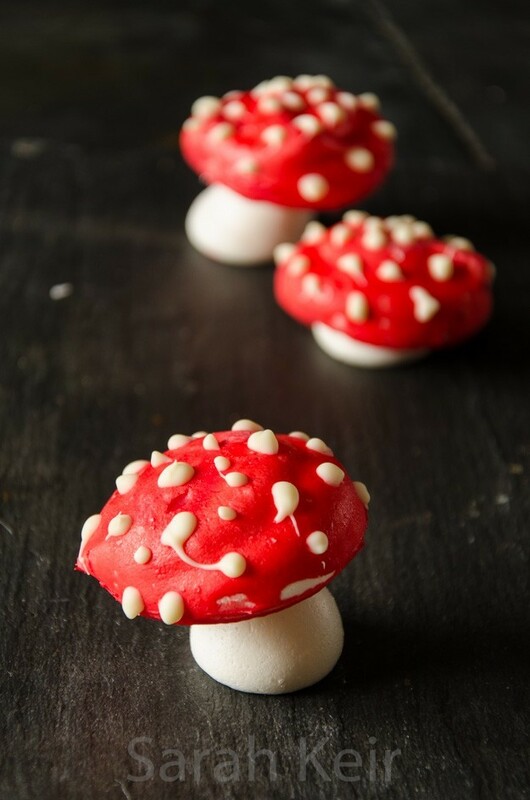 They are all made very simply from French meringue; field mushrooms with dark chocolate gills, bracket fungi from half moons of meringue dusted with cocoa powder and fly agarics decorated with the quintessential toadstool red cap with white spots. I felt I had to try and make the fly acargic toadstools; the myth from the far icy North of reindeer flying apparently comes the eating of fly agarics which are supposedly hallucinogenic. I don’t recommend trying them; all our mushroom collecting books suggest they are nasty poisonous. The fly agarics were the hardest to make because white chocolate is a nightmare to work with. Three times I melted white chocolate and added red gel paste and three times the chocolate seized. I read all the tricks I could; I added it before melting the chocolate, I added it to some melted chocolate and then added it to the rest. I tried freeze dried raspberry dust moistened with water instead but that wasn’t red enough. In a fit of desperation I read somewhere in blogland that adding a little water to chocolate is a disaster (it seizes) but if you add alot then something miraculous happens. And it did. I added about equal volume of hot (almost boiling) water to a lump of seized white chocolate which I had coloured red, beat it vigorously with a wooden spoon and lo and behold, liquid red chocolate! I used this to dip half the cooked meringue tops (I did it twice, repeating the process when the first layer was set in order to get a good strong red colour). Once set, I added white dots in melted white chocolate. I think next time I make them, I will try colouring the meringue for the tops red so there is no messing around with finicky white chocolate. Prepare two large baking sheets by lining them with baking parchment (siliconised paper). Preheat the oven to 100 ºC. Make sure a large glass/pyrex bowl and whisks are completely clean of any grease – I wipe down with kitchen paper dampened with vinegar. In the large bowl, whisk the egg whites, cream of tartar and salt until soft peaks form. At this stage, add the caster sugar one tablespoonful at a time, whisking well between each addition. When all the caster sugar is added, sift over the icing sugar and then whisk again until the mixture is thick and glossy. Stop at this stage otherwise over beating will cause the bubbles in the egg whites to breakdown and you’ll end up with runny meringue. Put the meringue in a pipping bag fitted with a 1 to 1.5cm plain nozzle. To pipe the caps, hold the bag vertically just above the baking sheet and squeeze the bag with even pressure until a round is formed – size and height up to you. Stop squeezing and twist the bag to remove. If any meringue peaks stay sticking up then you can flatten them with a dampened finger. Repeat this to make about 20 caps, leaving at least a couple of centimeters between each disc. To pipe the stems, hold the bag vertically again but as you squeeze the bag, pull upwards to form a vertical stem of meringue. 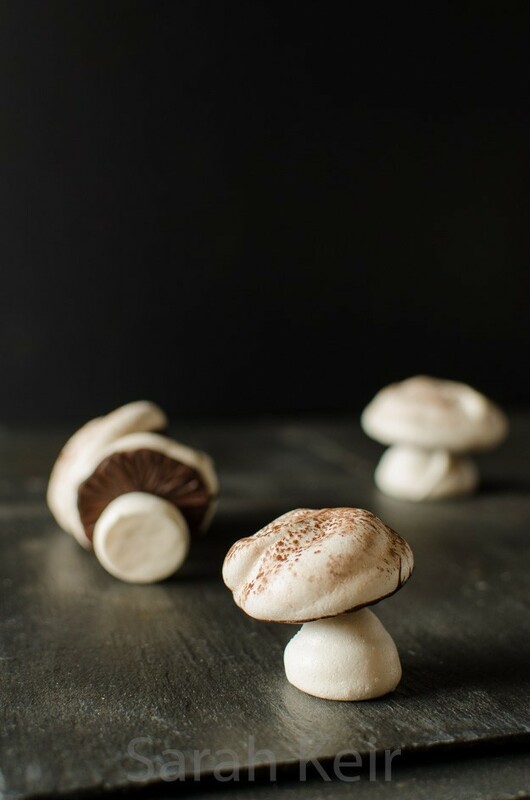 Don’t worry if they are a little lopsided – it adds to the mushrooms charm. Use the remaining meringue to make as many stems as possible. The bracket fungi were made from meringue piped into semi-circles with the inner circumference roughly what I though the curve of the cake would be. 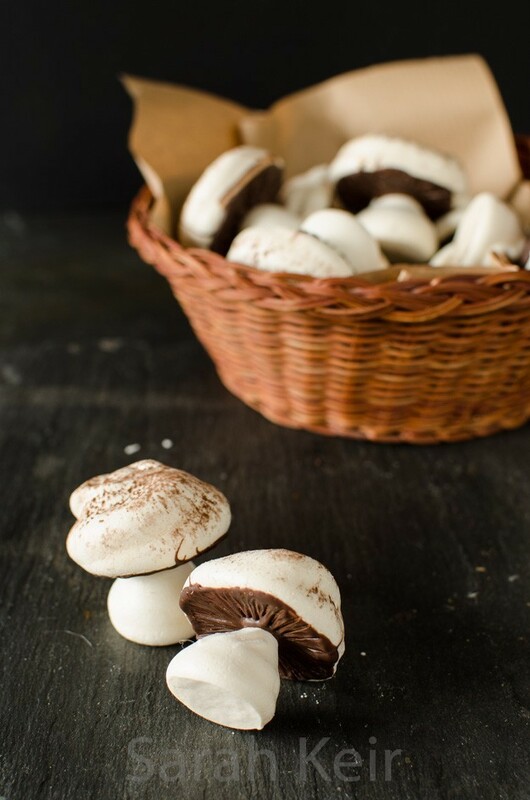 Dust with a light shower of cocoa powder over the meringue caps that will become regular mushrooms (I did half and half without). Place in the preheated oven for about an hour and half. Turn the oven off, prop the door open ajar and leave to completely cool. To assemble the mushrooms, use a metal skewer or small knife to make a small hole about 0.5cm diameter in the underside of the mushroom caps. Melt plain chocolate and when cooling down, paint the underside of the caps with the chocolate, use a toothpick to draw gill lines in the chocolate, drawing into the centre and firmly press a meringue stem into the centre of the underside of the cap so that it seats itself into the hole you made with a good glob of chocolate around. Set upside down on a baking tray until the chocolate has set. For the fly agarics, I made the holes in the underside of the caps then decorated the caps with red chocolate and piped on white chocolate spots and once dry I used some more melted white chocolate to fix the stems into the underside of the caps.